Is Queensland Security Solutions experienced? Queensland Security Solutions has over 10 years-experience and we are highly qualified when it comes to understand exactly what being secure means. Over many years we have developed a reputation as one of only a few full service security companies operating in Queensland. What type of dogs do you import and breed? 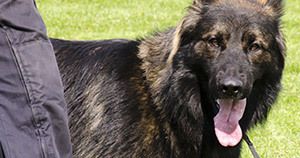 Queensland Security Solutions imports, breeds and trains Dutch Shepherds. We choose this breed as these masterful dogs have heightened senses, which can provide you with the highest quality protection. This breed of dog is impeccable at identifying human odour and applying their incredible instincts to support our guards to secure any site. What is the difference between training a personal security dog and a commercial security dog? Training dogs for commercial security patrol is generally the same as a personal protection dog and the skills are very similar. In saying this, a dog trained for commercial or high security purposes will be taught to protect a handler in the working environment and will be trained to defend from multiple attackers. What property types are commercially trained security dogs able to protect? Our alert and agile dogs are trained for work with guards for patrol duties. Our trainers will work with your specific security needs to ensure your security dog is trained in the light of your business security requirements. How long does it take to train a commercial or personal security dog? Generally it will take at least 3 months to train a commercial or personal security dog. The amount of time it will take to fully train each dog will depend on the requirements of the dog and the intensity of their training. Why is it beneficial to pair a security guard with a trained security dog? For peace of mind we often suggest a team of security guard and trained security dog to protect your site. This is because this pair forms a formidable team against intruders or potential security threats. It can be almost impossible to hide from a well-trained security guard and dog team. When it comes to our security dog and guard teams, we insist on the highest quality standards. Providing secure protection for your home is our priority. We provide a range of home security solutions in Queensland, including dog security and mobile patrols. Our team can evaluate your property and walk you through the best security options for your home. Some security options we may suggest include an effective burglar alarm, CCTV cameras, security patrols or own dog security. Do you provide security guard and security dog training? Training is something we take very seriously, and we ensure that our security courses are constantly optimised to ensure anyone who receives training from us is poised to take on any security situation with expertise and skill. We provide a number of courses through our Dogs@Work Group training program.